2018 NFL Draft: Can Baker Mayfield break the mold? And much of this is true, Mayfield is fiery, competitive, possesses good arm strength and is able to make plays outside of the pocket and on the move. With the success of shorter quarterbacks like Drew Brees and Russell Wilson and the proliferation of spread offense principles in the NFL Mayfield is entering the draft at a perfect time to succeed. 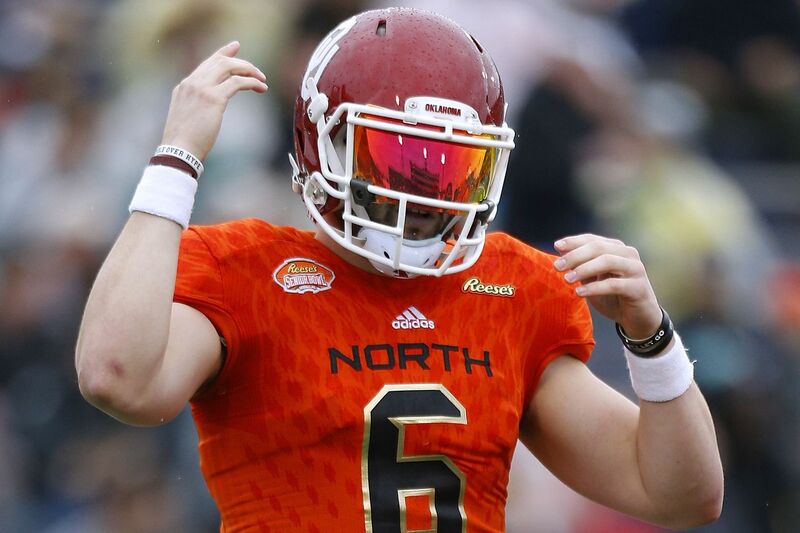 But Mayfield has two major question marks that make it hard to justify whether or not he is an ideal choice for the New York Giants at number two in the draft. Height and system. There’s an old adage from Bill Parcells: “if you draft exceptions soon you have a team full of exceptions.” There is a long list of short quarterbacks who were great college players but didn’t hack it in the NFL. There is also an equally long list of “system” quarterbacks who didn’t make it in the NFL. The main problem with Mayfield might not be his ability, but more so the inability of NFL coaches to think outside the mold. If anyone learned anything during the Super Bowl they should have learned that coaching is just as important as talent. The job that Doug Pederson did with the Philadelphia Eagles this year was one of the finest coaching jobs we have seen in a long time. This team completely changed its dynamic multiple times throughout the season to account for injuries to their best players (whether it be Jason Peters or, of course, Carson Wentz). Nick Foles is the perfect example of what a player is when a team focuses its energy on highlighting a player’s strengths and limiting their exposure. With Chip Kelly around him Nick Foles was able to do many wonderful things. When he went to St. Louis and was around Jeff Fisher there were many problems (similarly Jared Goff with Jeff Fisher and with Sean McVay is two drastically different players). After Wentz was hurt Foles was rushed into action and was iffy at best his first games as the starter. When the Eagles got some time to sit down and re-adjust things to suit Foles strengths he looked like he was a top 10 quarterback in the league. Coaching matters. This is why this early in the process before combines and pro-days and before we learn what teams really think about players, I want to highlight the most overlooked understood thing in the draft: being drafted into the right atmosphere. All draft picks who enter the NFL have succeeded in their football careers and contain either amazing production or amazing talent (because no production, talent-less players aren’t drafted), but where they are drafted can mean more to their long-term success than any other factor. A player who bonds well with a coach may get the right chances to prove their value while another player may never get the right opportunities. A cornerback who excels in his whole football life being stronger than his opponent and wearing him down physically at the line of scrimmage goes to a team that likes to play more zone ends up flaming out. A running back who does great things on the edge with his speed in college is asked in the NFL to run through 345-pound nose tackles and struggles. It’s not a coincidence that every year despite who is on their team the New England Patriots figure out ways to win (similarly despite how clearly talented the last few Rams teams were under Jeff Fisher were they didn’t win). This is what makes Mayfield intriguing, but also risky. At Oklahoma Mayfield had a lot of advantages. The system fit him well and there were a lot of times were Mayfield had huge windows to throw the ball and while he made the right reads, it won’t be that easy in the NFL. He will need to throw with more anticipation, and he will need to navigate the forest of 6’5” defensive linemen looking to deflect the football at the line of scrimmage. Brees looks like he’s playing on his tippy toes and Russell Wilson drops back deeper than almost every other quarterback and compensates with amazing arm strength. Mayfield will have to make similar adjustments. And he’ll have to have a coach who lets him play a little outside of the mold. You don’t ask Russell Westbrook to play off the ball, just like you don’t ask Steph Curry to play with his back to the basket. As an offensive coordinator, Pat Shurmur did some really impressive work in 2017. Case Keenum looked like an extremely competent starter for a long stretch of time when he hasn’t looked any bit of that in his career. Shurmur may be one of the coaches where Mayfield can excel, but that remains to be seen if Shurmur will stay aggressive and innovative as a head coach in a league where most creative men seem to coach scared once they reach the pinnacle. Shurmur has me optimistic about the Giants and their very near future. Mayfield drafted to a John Fox type-coach would be an instant career-ender. He would have no chance. What kind of head coach is Shurmur? That remains to be seen. Josh Rosen and Sam Darnold, on the other hand, seem like players who have more opportunity to excel despite the circumstances they land in. I think the margin of error is greater with these two not just from a height perspective, but they are also very talented players. The draft is a life of playing the percentages and hoping to hit big. It’s why Darnold and Rosen make more sense for the Giants than Mayfield because I don’t believe Mayfield’s talent is appreciably better than either of them.